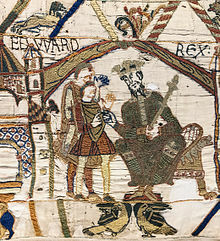 Edward the Confessor (stween 1003 an 1005 – 5 Januar 1066), son o Æthelred the Unready an Emma o Normandy, wis ane o the last Anglo-Saxon keengs o Ingland an is uisually regardit as the last keeng o the Hoose o Wessex, rulin frae 1042 tae 1066. ↑ The nummering o Inglis monarchs stairts anew efter the Norman conquest, which explains why the regnal nummers assigned tae Inglis krrngs named Edward begin wi the later Edward I o Ingland an dae nae include Edward the Confessor (who wis the third Keeng Edward). ↑ His successor Harold Godwinson wis o the Hoose o Godwin. Edgar the Aetheling wis proclaimed keeng after the Battle o Hastings in 1066, but never ruled an wis deponed efter aboot aicht weeks. This page wis last eeditit on 24 Februar 2018, at 23:19.